I turned on my printer to print out a form I needed to mail and it emitted a nasty high-pitched noise ... not quite a squeal, but almost. And it refused to feed paper more than about an inch at a time. Pressing the paper feed button made it roll the paper about an inch farther down, stop, and squee again. Another press, another inch, stop and squee. Each time it seemed to advance the paper quite smoothly -- it wasn't slipping, jamming or feeding at an angle. How do you google for a weird high pitched noise? I tried a few phrases in combination with epson c86 OR c84 OR c88 and hit several promising-looking URLs with domain names like fixyourownprinter.com ... but every hit turned out either to be someone describing a problem, then the discussion morphing into a discussion of unclogging ink cartridges, or someone describing a paper feed problem like mine and someone answering with unhelpful advice like "you could fix the mechanism if you could get the back panel off, but that's hard if you're not a printer repair shop and printer repair shops charge more than the printer is worth, so throw it away and buy a new printer." I try to be green -- I recycle, turn off lights, try to use low power PC and monitor, and I'll be damned if I'm going to throw out a great big hunk of mostly nonrecycleable plastic every couple years without at least trying to fix it. Giving up on web searching, I unplugged the printer and started pushing and poking at it to see what I could disassemble. The back cover clearly was tucked into the two side covers ... it clearly wasn't going anywhere until those side covers came off. The side covers had several holes to the plastic piece underneath, with arrows near them seeming to invite "push and slide". But there didn't seem to be much consistency to whether I was supposed to push the outer cover, or the inner tab, in the direction of the arrow. I finally just ignored the arrows and used screwdrivers and pliers to poke and compress and wedge and slide until I got the left side cover (left as seen from the front of the printer) off. The right side cover was more challenging -- I had all the tabs loose, but the cover seemed to stick at a point near the front, near the "Dura-Brite" oval. After twenty minutes of attempted finesse, I switched to trying to force it (since the alternatives were to throw the printer in the garbage or pay a repair shop more than the price of a new printer). I heard two sharp CRACKs as of plastic tabs breaking ... and the stuck front side popped loose. Curiously, I couldn't find any obviously broken plastic inside; forcing it was apparently the right and only way to get that side cover off. Inside ... everything in the paper path looked fine. I pulled out an errant paper shard that's been floating in there for about a year (I knew right away when I fed that sheet of business cards with some of the cards already removed that it had been a bad idea) but it hadn't been touching any of the mechanism. What's this on the left side, though? 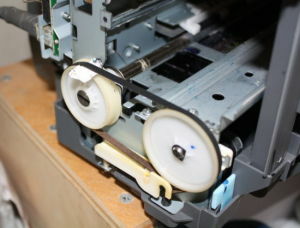 There was a tiny ink-smudged piece of paper between one of the pulleys and its toothed belt. Hmm. Doesn't look like it ought to be related, but it clearly doesn't belong ... so I pulled it out. I poked and prodded and shone flashlights for a while longer, but couldn't find anything else. Darn! Well, just for the heck of it, I plugged the printer back in and switched it on. No squee tone! Hmm ... I fed it a piece of scratch paper and pushed the paper feed key ... and the paper went straight through, no noise, no fuss. The moral of the story is: don't let ignorance stop you from trying to fix things. Maybe the problem was that little piece of paper wedged in the wheel after all. Or maybe, as I often suspect, sometimes hardware just gets lonely and wants some attention ... and if you're willing to spend an hour dinking with it, it doesn't matter how little you know about what's actually wrong. All it really wanted was your attention.